Today marks the 20th anniversary of the first World Water Day, a day established by the United Nations to focus attention on the importance of fresh water around the globe. Globally, fresh water is increasingly becoming an endangered resource. According to a U.S. State Department document released on World Water Day last year, the need for fresh water will exceed the supply by 40 percent by the year 2030. We’re probably all aware to some extent of water shortages and their implications that continually plague the predominately poor inhabitants of undeveloped countries. The sight of young children or forsaken mothers scrounging daily for limited sources of clean water for drinking and cooking appear often on TV documentaries and the like. Beyond this, however, it’s probably safe to say that the vast majority of U.S. citizenry assumes that the U.S. and North America more generally have enough readily accessible sources of fresh water to meet our everyday individual and societal wants, needs and requirements. Unfortunately, as I personally was surprised to learn while researching this subject, that assumption is demonstrably invalid, especially when we assess the likely circumstances in the the coming decades. 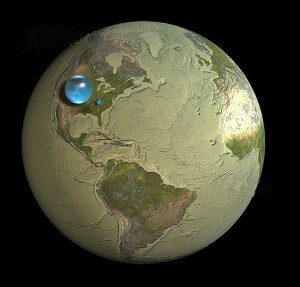 The indisputable fact is that water scarcity is rapidly becoming a significant factor in the way of life in the U.S. Without sufficient foresight and resources for sustainable management of fresh water resources, the problem will become critical in just a decade or two. The range of effects may include (but are not limited to): long-term restrictions on home and community water usage; significant declines in agricultural output as well as meat and dairy produce that require huge amounts of water for irrigation and sustenance of livestock; shortages of just about every product made using water-dependent manufacturing processes (e.g. steel, plastics, pharmaceuticals); and disruptions or complete shutdown of several critical sources of hydroelectric power. It should be clear that the consequences of diminishing water supplies from the individual and collective effects of just these few items can adversely affect the routine ways of life – and, importantly, can do so within the time frame of a single generation. The fundamentals behind a coming water crisis are encompassed straightforwardly by recognizing that, while approximately 70 percent of the Earth’s surface is covered by water, less than one percent is fresh and accessible for human use. The rest is either salt water of the Earth’s vast seas, fresh water frozen in the polar ice caps, or too inaccessible for practical usage. Of the accessible fresh water, there is no escaping the fact that over the past several decades some of the largest lakes and rivers around the globe are being depleted at a “very frightening pace,” and many of the most important underground aquifers that we depend on to irrigate crops will soon be unable to keep up with increasing demands placed upon them (see: 30 Facts On The Coming Water Crisis That Will Change Everything). According to Federation for American Immigration Reform, some areas of the United States are already experiencing acute water shortages, “a trend that will spread throughout the country in the coming years,” whether it be related to climate change and/or naturally occurring extended periods of drought coupled with the demands of increasing populations. One of the most prominent examples is the U.S. Southwest where the region’s most important lake, Lake Mead, created subsequent to completion of Hoover Dam in 1937, now provides fresh water to 30 million people. The problem is that the drain of water from the lake already stretches the limits of allocations for accommodating previously unanticipated population growth, especially within the areas encompassing Las Vegas, Phoenix and Denver. The principal competition for Lake Mead water is irrigation necessary to sustain agriculture in Imperial Valley, California, which produces 80% of the nation’s winter vegetables. An actual or near crisis stage is not far off if predictions by some researchers are close to the mark in calling for water levels to fall by 2021 to a point where remaining water would become inaccessible. Moreover, reaching this point would shut down the critical hydroelectric generators within Hoover Dam which is the primary source of electricity in the west, including Los Angeles. Compounding the problem is that sister dams to Hoover (Glen Canyon, Parker and Davis) have already outgrown their capacity to provide sufficient water for agricultural irrigation and spinning the turbines for generating electricity. Compounding the problem is the diminishing flow of water down the Colorado River. This reflects the consequences of persistent drought conditions and diversions of water for agriculture, industry and municipal uses along its path – even though quotas on diverted water are already considered insufficient for those uses. The net result is that restoration of water levels behind the dams is problematic at best. Another example of major concern and consequence is depletion of the largest and most important underground source of water in the U.S., the Ogallala Aquifer under the High Plains stretching from southern South Dakota through parts of Nebraska, Wyoming, Colorado, Kansas, Oklahoma, New Mexico, and northern Texas. The aquifer has been the major source of water for municipal and industrial development for decades. Most significantly it has been critical for agriculture in the American heartland oft referred to as the bread basket not just of the U.S., but the world. Unfortunately, the era of blindly assuming the largess of the aquifer reflects an unlimited source of water is destined to come to end. For decades the Ogallala has tapped at rates thousands of times greater than it is being restored. The Ogallala Aquifer was formed about 10 million years ago when water flowed onto the plains from retreating glaciers and Rocky Mountain streams. For all intents and purposes, it is no longer being recharged. Once it’s gone, it’s gone, end of story. The current estimate is that, if irrigation demands continue to exploit the aquifer at rates comparable on average to those over the last 10 years, it will be essentially used up in only 25 years (more information). Reducing the drain by limiting extraction of water can only postpone the inevitable. Even if by happenstance there were flooding rains year after year, the collapse of the space occupied by the aquifer coupled with the impermeability of the ground above effectively precludes it becoming recharged. In most of the eastern U.S., there are generally reliable sources of replenishable surface and underground sources of fresh water, subject only to periodic droughts alternating with periods of above-average precipitation. But independent of the distribution and amounts of accessible fresh water, it’s extremely important to distinguish between clean drinkable fresh water and that which is not. With some limits on the levels of pollution and nature of contaminants, the latter can be used for irrigation. But much stricter limits are required for safe drinking water. According to a recent United Nations Environment Programme (UNEP) and the California-based Pacific Institute joint report, worldwide 2 billion tons of human and animal waste and industrial pollutants are dumped untreated into streams, rivers and lakes of all sizes and shapes each day. While untreated waste water is virtually the norm in the developing world, the report makes it clear the U.S. is not immune from fresh water pollution. Modern sewage treatment plants in this country generally rid pathogens from human waste. However, increases in animal wastes from concentrations of live stock at meat and dairy farms across the country are becoming increasingly more pervasive in surface waters. The same is true of water from ground sources as contamination leaches through the surface. Additionally, increasing amounts of chemical substances (e.g., birth control pills, illegal drugs, insect repellent) are being found in drinking water even after passing through water treatment facilities. While there are likely implications to human health, thus far research has been too limited to convincingly demonstrate it. But there should be no excuse for complacency in advocating more comprehensive research (see: Cocaine, Spices, Hormones Found in Drinking Water). Lastly, there remains the critical question of whether there is anything meaningful that can be done to at least reduce the rate at which fresh water is being depleted and contaminated. Increases in conservation programs are certainly a necessary and viable option. Thus far, however, the experience is that gains from conservation and more efficient water management programs have been overwhelmed by the increasing demands tied to population growth. That also applies to attempts to reduce water wasted by individual households, irrigation, manufacturing, etc. One somewhat promising sign is the recently announced NOAA construction of the National Water Center (NWC) on the campus of the University of Alabama. According to Louis Uccellini, director of NOAA’s National Weather Service, the NWC will be the first federal national water resources facility and will become the starting point for new hydrology research and operations in the United States. If all else fails, there is always resurrecting grandiose proposals for transferring large amounts of the abundant fresh water from Canada to the United States. On second thought, let’s not. World Water Day Clean Up on Roosevelt Island:March 23, 11:00 a.m. to 1:00 p.m.
Potomac Riverkeeper’s Riverwatcher Training – 2013 Kickoff!! May 11, 11:00 a.m. to 1:00 p.m.
Also of interest: EPA is designating March 18-24 as the fifth annual “fix a leak week” with focus on relatively simple fixes which can reduce the more than 10,000 gallons of water wasted each year by the average American household (nationwide this amounts to 1 trillion gallons, enough to fill 330,000 eight-lane Olympic size swimming pools).